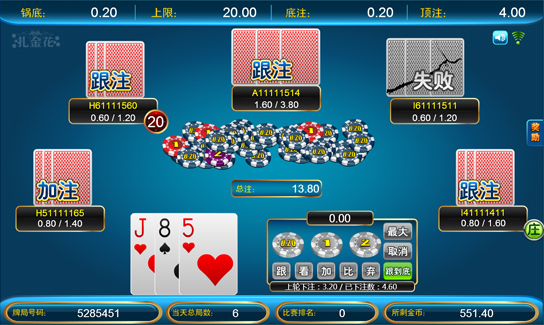 Zha Jin Hua is a game played by 2-6 players simultaneously using a deck of standard 52 poker cards exclude 2 jokers. In each game, system will randomly pick a player as the banker. Card will be dealt to the banker follow by the players at anti clock wise order. The objective of the game is players shall play with military and tactics, as per game rules to stand to final and win all the wagers on the table. Once a games started, system wil deduct the initial wayer according to the table limit. Initial wager: Every player's initial wager will be different according to the table limit been selected to enter. View card : Player who does not quit the game is allowed to view own cards when reach his turns. After viewing the card, player can choose to "add", "follow", "VS with other player in the game". VS with other player in game : player can VS with other player after 2nd round in the game. Player who ask for VS will need to double up the wagers. Card type is the first judgement rule, then ranks. If both with same card type and same ranks, the one initiates comparision loses. Follow/ Add wagers : every player is able to add/ follow the wagers by previous players as long as the wagers added/ followed does not hit the limit. Three Of A Kind : Three cards of same rank. e.g. 999, AAA. Straight Flush : Three suited cards in sequence. e.g. 789 with all SPADE. Straight : Three cards in sequence. e.g. 345. High Card : None of the above. For card types: Three Of A Kind > Straight Flush > Flush > Straight > Pair > High Card. For ranks: A > K > Q > J > 10 > 9 > 8 > 7 > 6 > 5 > 4 > 3 > 2.